This species can be distinguished from T.(H.) chrysantha by the nature of the hairs on the calyx and the fruit as well as by features of the corolla and leaf. The calyx and capsule are densely covered by long rusty hairs, branched hairs if present are few. The corolla lacks the distinctive red lines present in the throat of T.(H.) chrysantha. The leaves have numerous rusty hairs present on the lower surface. 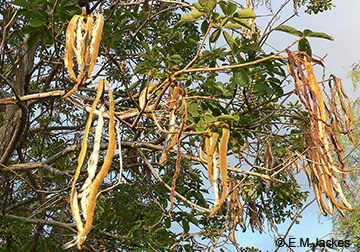 This small tree has capsules to 40 cm long and 2 cm wide, the winged seeds are to 3 cm long.